debbie kay designs: Flexible Seating Reveal! 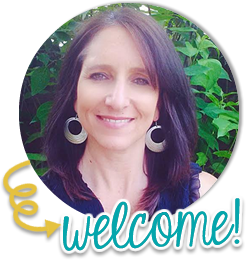 It's finally time for my flexible seating reveal! Woot woot! 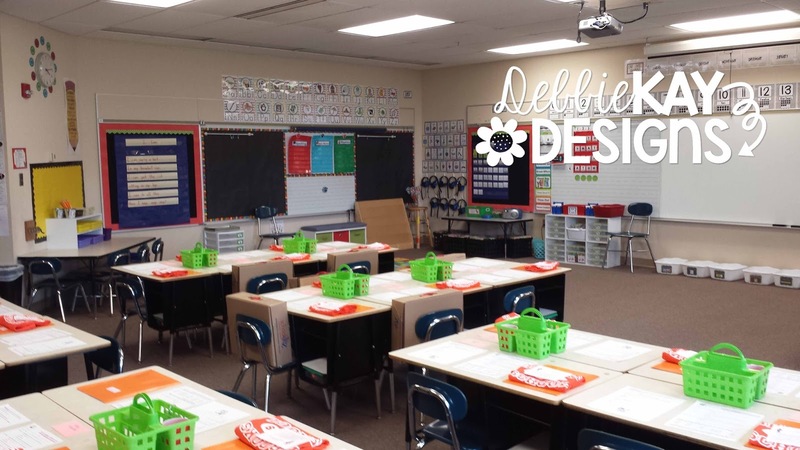 I have been super motivated to transform my room from very traditional to one which is more student-centered with flexible seating options. 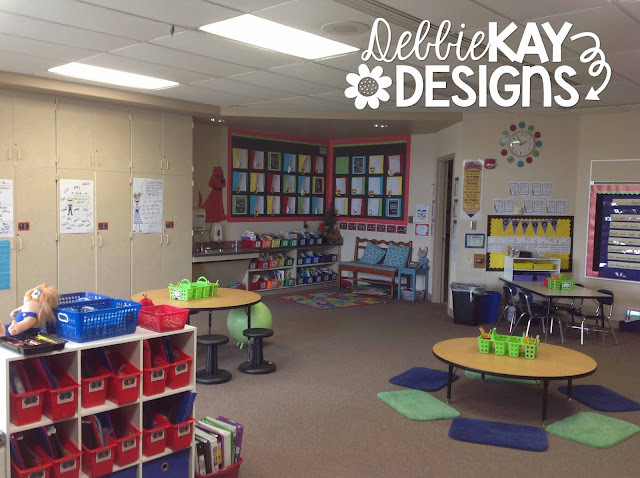 I loved what Angie Olson did with her classroom and it fired me up to make changes, too! Thanks, Angie! 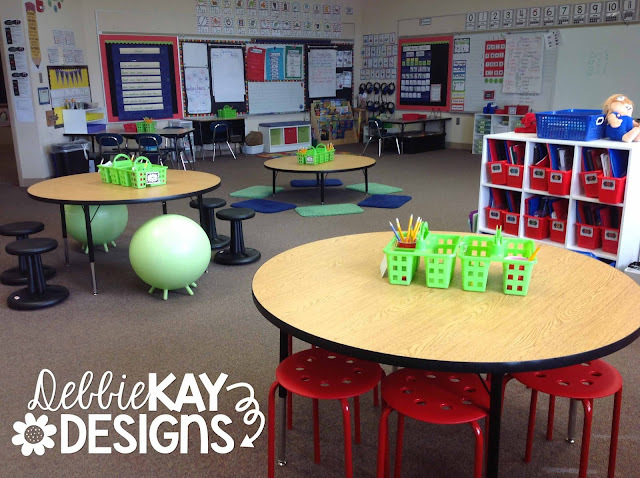 A few weeks ago I blogged about my Donors Choose project(s) which funded new tables and Wobble Chairs for my classroom. Read about it here. 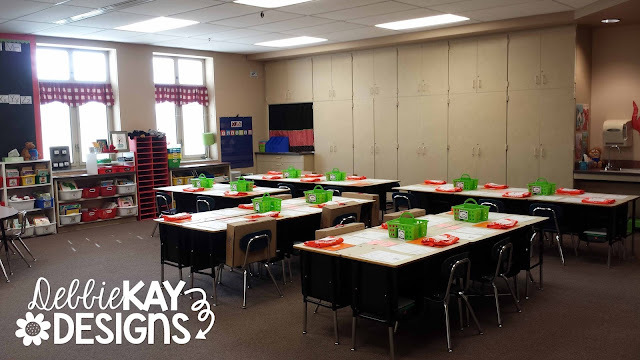 Our new tables finally arrived and the classroom transformation is now complete. We've been adjusting to our new flexible seating and it's been awesome! First, here are pictures of what my classroom looked like before with 26 individual student desks. These photos were taken the day before school began. You can see that the seating and tables were very traditional. The only open floor space was at the front of the room. I know!!!! It's completely different, right!? 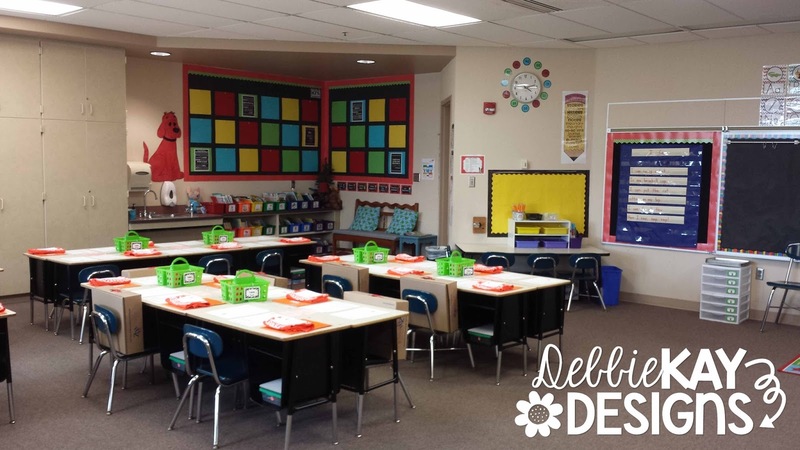 All but one student desk has been removed from the room. In their place are 3 new round tables courtesy of fundraising through Donors Choose. I chose 48" round tables which are the perfect size for us. I went back and forth with deciding between a 60" round or 48" and I'm glad I chose the 48" because of the floor space I now have. I can get six 1st graders around each table. 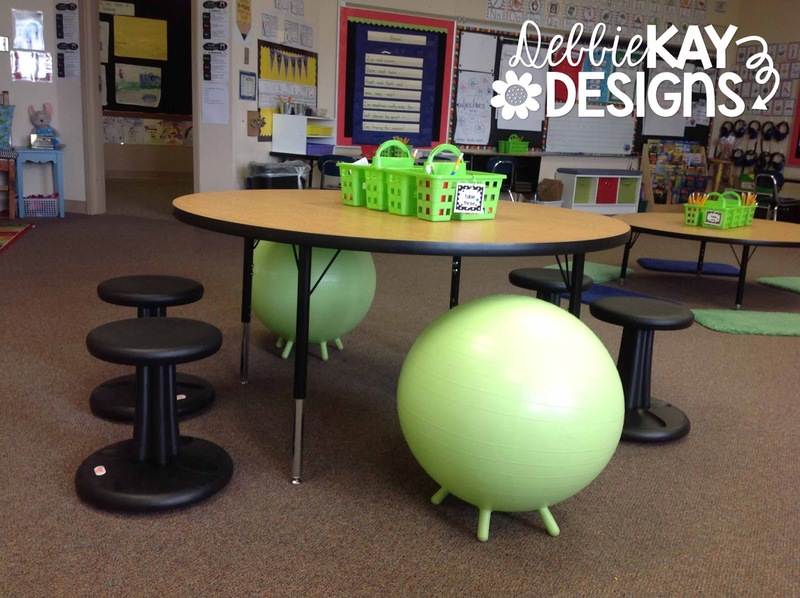 Each of the round tables has different kinds of seating. I blogged about how I was able to get 4 Wobble Chairs through Donors Choose. Again, you can read about that here. These Wobble Chairs are at one table along with 2 flexibility balls I purchased at Target. 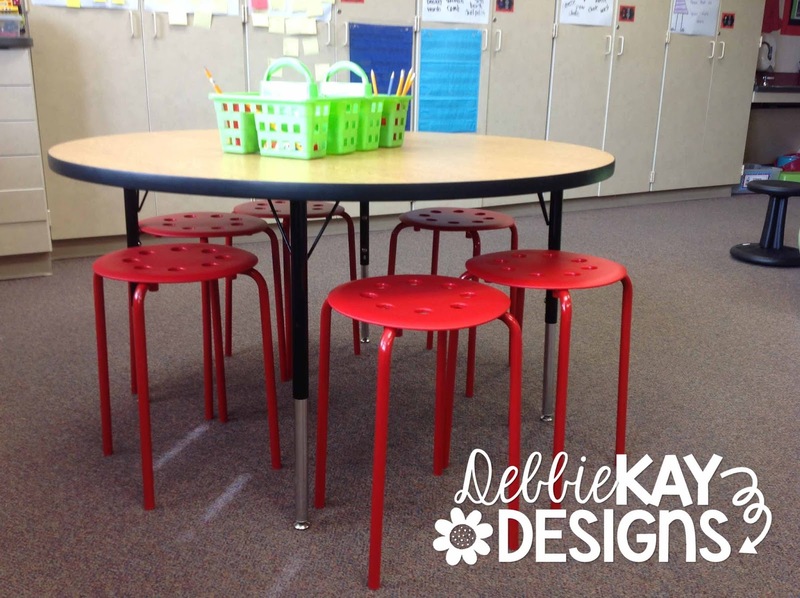 The second table I lowered to 15" so that I could allow students to sit on the floor. When I ordered tables, this one is actually a lower height than the other two for that reason (the tables came in two sizes, both adjustable). 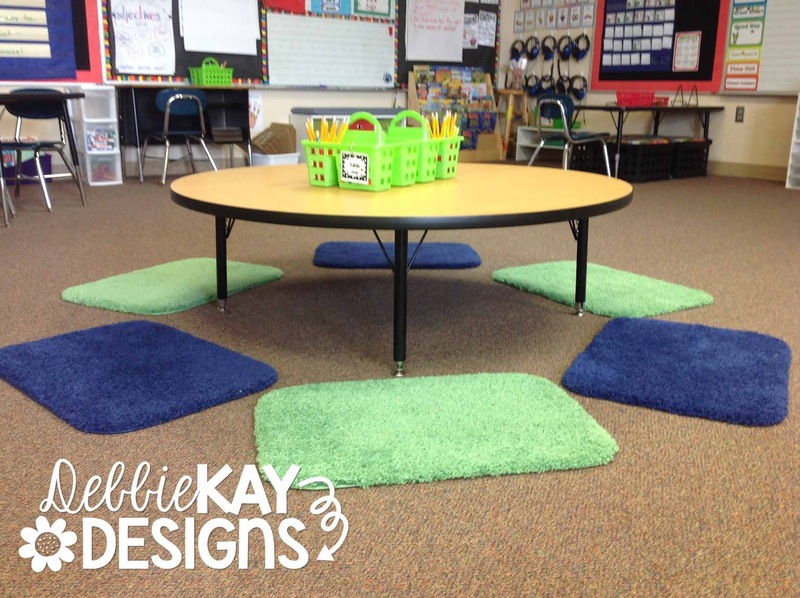 The bath mats are super cozy to sit on and help kids to know that only 6 kiddos can be at this table at a time. Bath mats were purchased at Target. The third table I raised up so that kids could sit at these stools. Stools were purchased from Ikea. They were a little taller than I expected; however the students have been able to use them just fine. 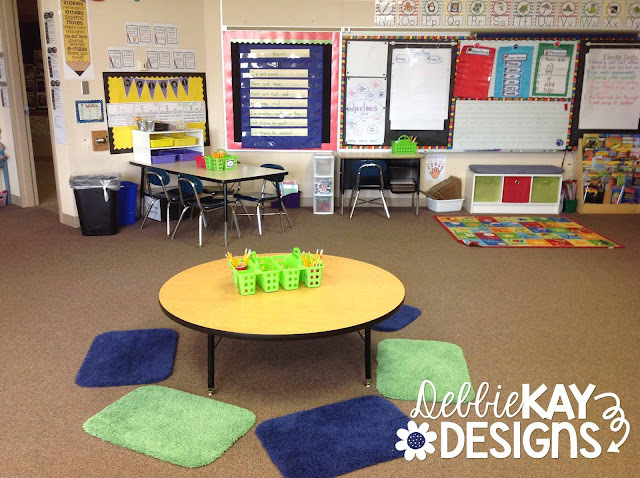 Most of my 1st graders can reach the floor with their toes, the taller ones can sit with their feet flat on the floor. I think it gives them a chance to stretch out their legs a little, which has been an added benefit to these stools that I didn't count on originally. I just thought they looked cool! A total of 18 kids can sit at these 3 tables. So, where does everyone else sit? One of the huge benefits to getting rid of all of the individual students desks was all the added floor space I got back. A lot of kids love to use a clipboard and spread out around the room. Some kids use our writing center to work. It's not just for writing anymore: kids use it at math time and throughout the day as needed for workspace. The seating here is traditional chairs. Other kids use our Listening Center table, which is now a flexible workspace as well. Here I have crate seating. That chair is not normally there... a student had brought it over to work with some other kids there. 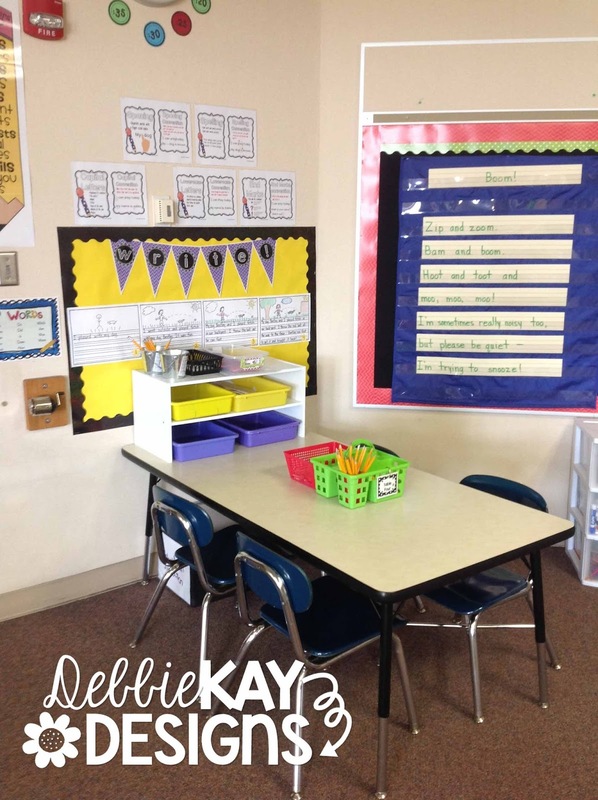 I still have one individual student desk in the room. See it over there against the wall? 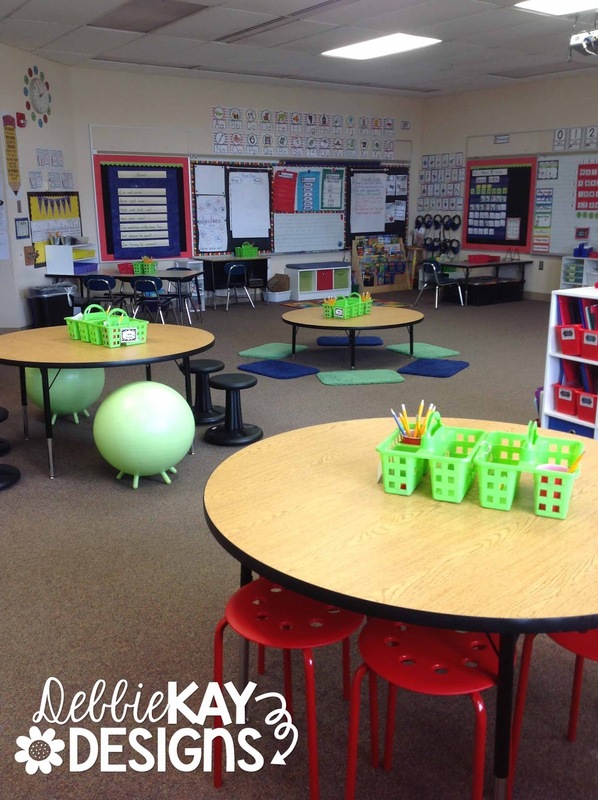 I wanted to have a place for kids who want/need a break or some personal space. At most times of the day there is a kid working there. We are loving it and the transition has been mostly seamless. The first few days we had a few issues with "I was here first" type behaviors, but we just kept referring back to the rules we had made and those issues have mostly disappeared. We have had a lot of visitors peek in at our room. Teachers, principals, our assistant superintendent and other administrators have all stopped by to see our space. 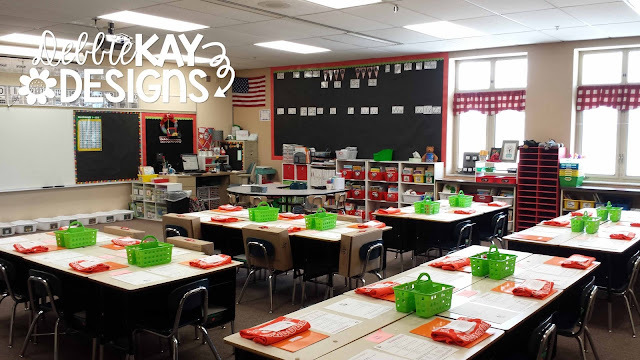 The comment I get the most are that the room is so student-centered now and that the students are very engaged in their work. Music to my ears! The bookshelves are cube storage. 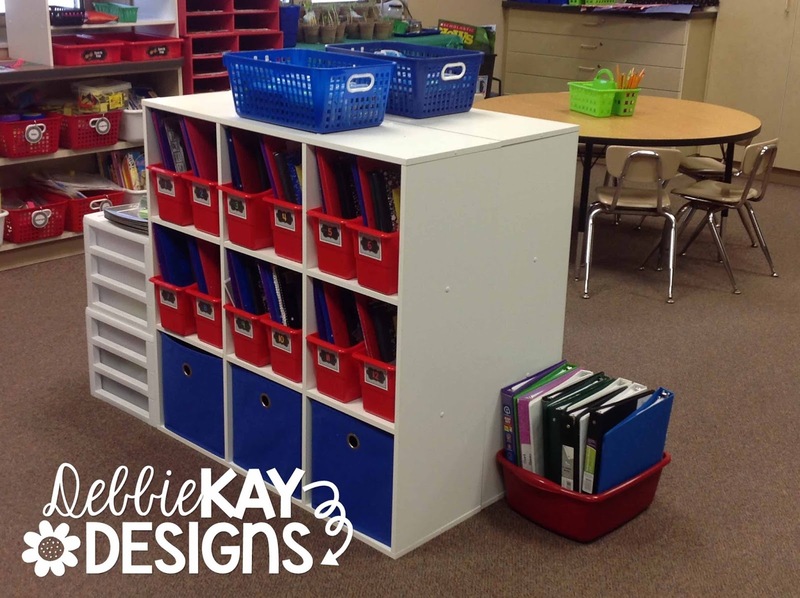 You can get this type of shelving from Target or Walmart. I purchased magazine bins from Really Good Stuff and labeled them with each student's number. (I use numbers so that I don't have to re-label every year.) In the bins we keep our folders, composition notebooks for math journaling and writing, etc. The fabric cube storage bins below are from Target. 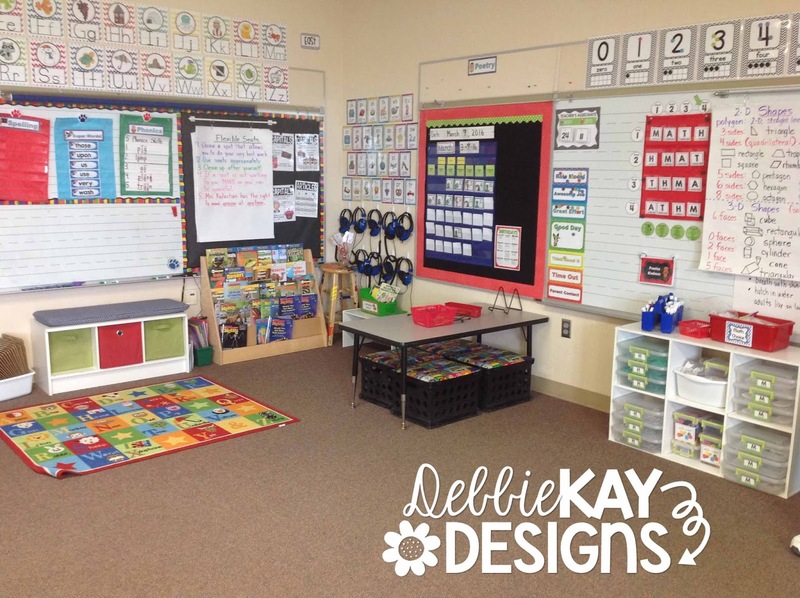 In those we store our art boxes which have our crayons, markers, scissors, and glue sticks. Each side holds supplies for 12 students. This helps so that students are not all right on top of each other trying to get supplies out. Transition time took a little getting used to now that each student needs to retrieve their supplies from a central location, but with some rules and practice we are good now. So, what do you think? I welcome your questions or comments below. I'll leave you with a few more photos to show off our new furniture and flexible workspace which we are super proud of and totally excited about! Thanks for stopping by! 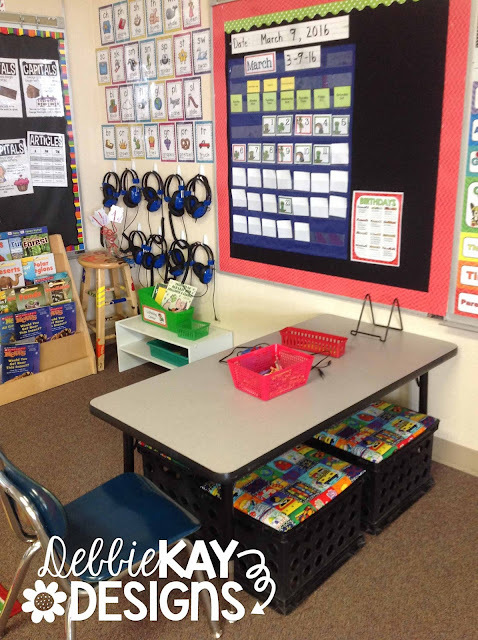 I have been implementing flexible seating for the last 2 weeks and my students love it but we have been really struggling with my students' supplies. They have so many workbooks and journals, that keeping them in those magazine files and having them bring these files to their seat is not working and they are leaving their items everywhere!